The Santa Barbara Old Time Fiddlers’ Convention will be celebrating its 40th anniversary this October. In these pages, its founder, Peter Feldmann, shares some of the history and philosophy behind the event, which is noted for being one of the finest old time music gatherings on the west coast. The Santa Barbara Old Time Fiddlers’ Convention, held first in 1972 at UCSB, found its causation — strangely enough — three years earlier at a rock festival held near Oakland, California at Altamont in 1969. The promoters of that festival, hoping to imitate the success of Woodstock, decided on an outdoor festival with the Rolling Stones and the Grateful Dead as headliners. To beef up security, members of the Hell’s Angeles motorcycle club were stationed on and around the stage area. During the Stone’s set, a drunk jumped on stage and was fatally stabbed by a Hell’s Angel. As a typical politician’s reaction to this, the Alameda County Board Of Supervisors passed an ordinance immediately banning all outdoor music festivals. Not wanting to be outdone by their northern brethren, the Los Angeles County supervisors passed a similar ban, which included a Mozart festival and the Topanga Canyon Banjo/Fiddle Contest, and certainly many other dangerous outdoor activities. So much for politicians and bureaucrats’ approach to the arts . . . Early in 1970, I was contacted by the organizers of the Topanga Banjo/Fiddle contest in a call for assistance. Their event had been banned in LA; would I, could I, help them stage their event somewhere in Santa Barbara County, whose supervisors had not yet banned all outdoor music? As a big fan of the Topanga contest, I promised to try my best, and, after some reflection, decided to approach Arts & Lectures at UCSB with the idea of using their campus for the event. I already knew Peg Armstong, Arts & Lectures’ director, from some concerts I had presented through their auspices in my role as chief of the Old Time Music Front, a student’s organization I had founded in 1963 in an effort to subvert the local students into appreciating American folk, blues, old time, and bluegrass music by hosting campus concerts of musician friends such as Mance Lipscomb, The New Lost City Ramblers, Bill Monroe, The Stanley Brothers, and many others. Peg was enthusiastic abut the possibilities and we began making preparations with the Topanga people about hosting their contest. About two weeks later, I received a frantic call from Peg Armstrong after just returning from playing some music at a beach party with “Big Jim” Griffith. “There’s a big emergency meeting at the administration building re. the banjo/fiddle contest today, and it’s happening in 1 1-2 hours!” So, with no time to change, the two of us headed to the fifth floor of the administration building and walked into a conference room in our beach attire… There, seating around a U-shaped table were the Chancellor, the Vice Chancellor, Peg, The UCSB Fire Chief, and the campus police chief, plus assistants. They were not looking very happy. The thrust of the meeting was that they wanted me to assure them that there was not going to be a major riot, including motorcycle clubs, dope and wine at the event(!). Jim and I brushed the sand from our swimming trunks and spoke for 20 minutes, trying to get the authorities to understand that this was planned as a family affair, not a rock riot a la Altamont. They seemed unconvinced, to say the least, and the chance that they would approve the relocation of the Topanga contest seemed to fade rapidly. It was a few days later that I received the call from Peg: “Peter! Great news! The contest’s been approved after all!”. It was a while before I understood what had happened to change the attitude of the authorities: I had been giving fiddle lessons to the daughter of the Detective Captain of the Santa Barbara Police Department. I mentioned the event to her, and that it might be held at UCSB. She told her dad, who phoned the chief of the UCSB Police, asking that his daughter be allowed to enter! Apparently, the light began to dawn with the campus officials, who gave their approval for the banjo/fiddle contest to happen that May. The contest was held on a glorious spring day and went off without a hitch — everyone was happy, even the police chief. The following year, I got a call from Arts & Lectures: “Where’s our fiddle contest? !” I had to explain to them that the Topanga organizers had followed my suggestion and contacted UCLA to move the ’71 contest to the UCLA baseball diamond. Peg was disappointed and asked, “Why can’t we have our own contest? Would you produce a similar event for us?” I agreed to get an event going for them next year, provided that we held ours in the fall so as not to interfere with the Topanga contest. 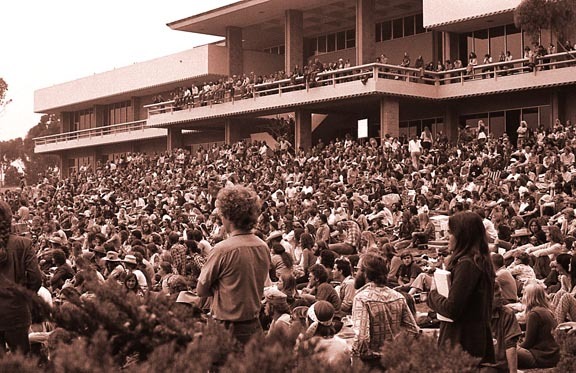 And that’s how, in 1972, the first Santa Barbara Old Time Fiddlers’ Convention came to be. In the next entry, we’ll take a look at the early years of the Convention . . . and our philosophy behind the event. Thanks for reading. Your comments are welcome; just follow the directions in the link “How to participate“. This entry was posted in General and tagged Bill Monroe, fiddler, Folk Music, Mance Lipscomb, Old Time Fiddlers' Convention, old time music, Peter Feldmann, santa barbara, UCSB. Bookmark the permalink. Just fascinating. I had no idea of this contest history. Can’t wait to talk to Byron about it. Thanks a bunch. Yeah, Byron has played that event several times. Tell him Hi from me! I remember the year Gene (McGeorge) was one of the judges, for two reasons: First, he’d just bought himself new jeans and a new Levi shirt for the occasion, and apparently so had all the other judges, so it looked like they were all in uniform. And second, one fiddler/violinist was so over-the-top fancy and accomplished that a special award had to be invented on the spot: the Paganini Award. Do you still have that? Yeah, spiffy judges . . . nothing but the best! I recall the Paganini Award being a one-of-a-kind deal, along with another one for “Best Legs”. Peter – don’t forget the “Henry David Thoreau” award to the performer who “danced to the tune of a different drummer”, I believe. It was an honor and a pleasure to be a judge there. I’m keeping up the good work by judging Topanga. btw: Gross Junction, 3 of your banjo judges, won 3rd place in singing that year with an “Acopulco” (thank you Carole Miller, wherever you are!) version of “I Cried Again”. Yeah, Jack, you judges worked overtime coming up with rather strange prizes. One prize I got together was a pint of genuine Tennessee moonshine for the best fiddler! I attended the 1974 event. I remember that the guest bands were outstanding. I was too young and too new to the scene to note who they were. Do you have a list of who the bands were? Ron, That was the third annual convention — 40 years ago! If I have any notes on the performers, they are in some cardboard box whose whereabouts I do not know. 🙂 As you may remember, in those early years, we used a theme for each year’s event. I know that Texas fiddler Eck Robertson was on the poster and button, and that we devoted that year to Texas style fiddling. There was only one hired band, who performed during the judges’ lunch break, and I can’t remember who it was. The rest of the “performers” were contestants who simply showed up to share their music. Thanks Peter. I have such fond memories of that day.